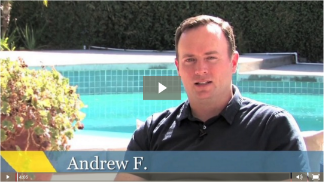 When we started working with Andrew, we worked out a fairly advanced loan structure for him. There were tax implications involved with the proposed financing, and Andrew was impressed with our team’s deep understanding of those tax implications. He felt like we truly had his best interests in mind when we presented him with the loan. He agreed to get pre-approved and we moved forward on an offer on a home. Unfortunately, we initially lost out to a cash buyer, but we also knew it only took one right home and it was our job to find it. Thanks to our tenacity, we were able to negotiate the right offer on the right home for Andrew and his family even thru a multiple-offer situation. Never one to stop adding value for our clients, we also recommended a great contractor to Andrew who could complete the finishing touches that turned a great house into Andrew’s perfect home. With a large yard and pool for his 4 boys, and a garden area outside the kitchen for his wife who loves to cook and grow her own ingredients, it was a perfect match for Andrew and his family! We work with a lot of clients like Andrew who are looking to relocate to Orange County, California from out-of-state or even from other areas within the state, too. We know that relocation can be difficult, especially when a buyer is completely unfamiliar with the area. That’s why we always take extra time to educate these clients on the unique aspects of the real estate market here in Orange County. We strive to have an efficient process flow, so that our clients can focus on the excitement of their future. We are pleased that we could help Andrew find the right home at the right price by staying focused and methodical during a time when the market was moving fast. Even better, we are thrilled that we now have a lifelong friendship established with Andrew and that Andrew continues to work with Inspira Group by recommending us to his own clients and friends, too. If you are looking to relocate to Orange County, set up a consultation and we can advise you on the best strategy to find you the right home and right loan within the timeframe that you need.